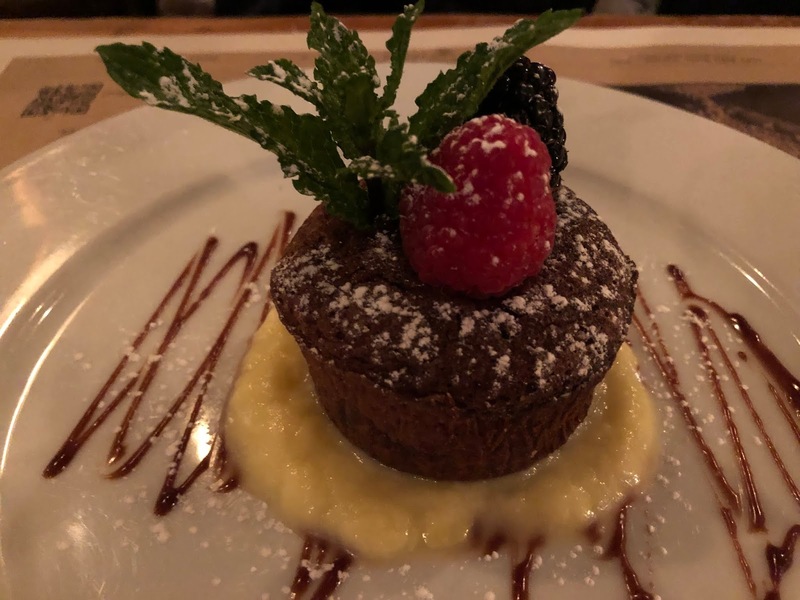 Over Christmas Break, we spent nine nights in New York City, one of the best cities in the United States for gluten free dining. On Christmas Day, we had dinner at Senza Gluten, one of our favorite restaurants in New York City. 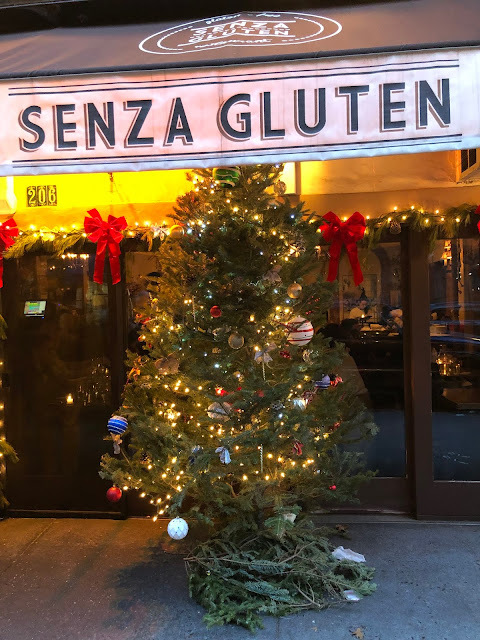 Everything at Senza Gluten is gluten free, and they recently opened Senza Gluten Cafe & Bakery down the street, which I will review in my next post about fast casual dining in New York City. My only disappointment on this visit was the bread, because it did not taste very fresh. It probably just needed to be heated, but it was served at room temperature. 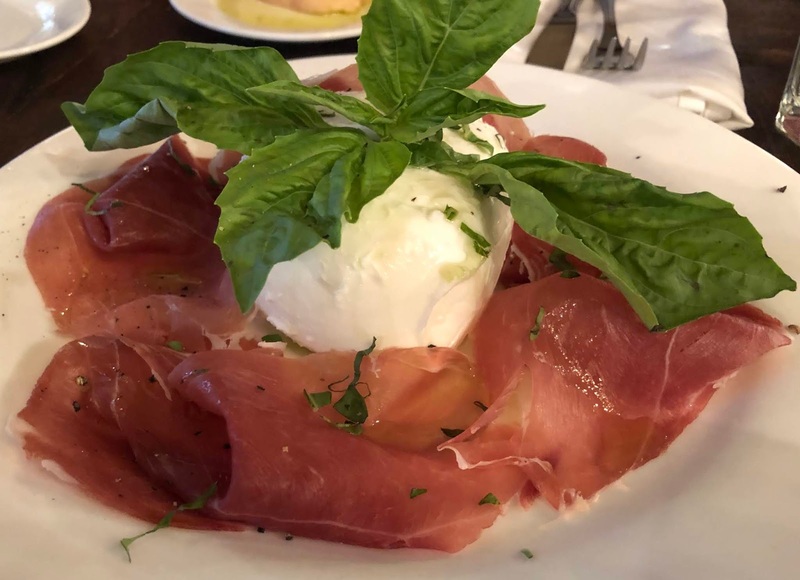 Our favorite anitipasti at Senza Gluten is the buffalo mozzarella and prosciutto di Parma. It might be the best I have ever had at a restaurant, including those we have dined at in Italy. 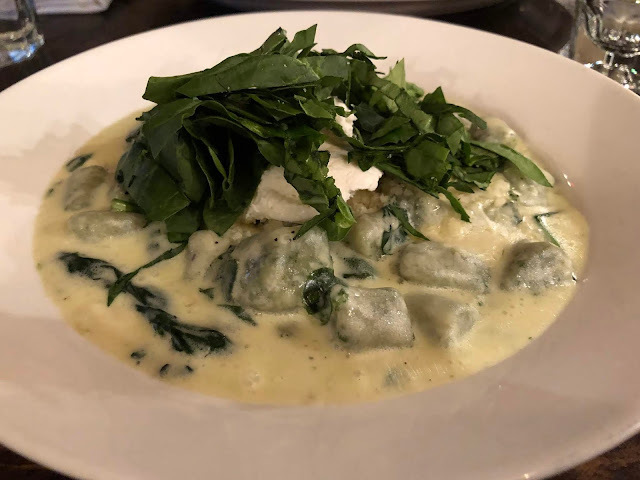 For an entree, I chose one of the holiday specials - homemade spinach gnocchi with four cheeses (mozzarella, Parmesan, ricotta, and fontina). If this was on their regular menu, I would order it on every visit. It was definitely our favorite entree out of the three we ordered. 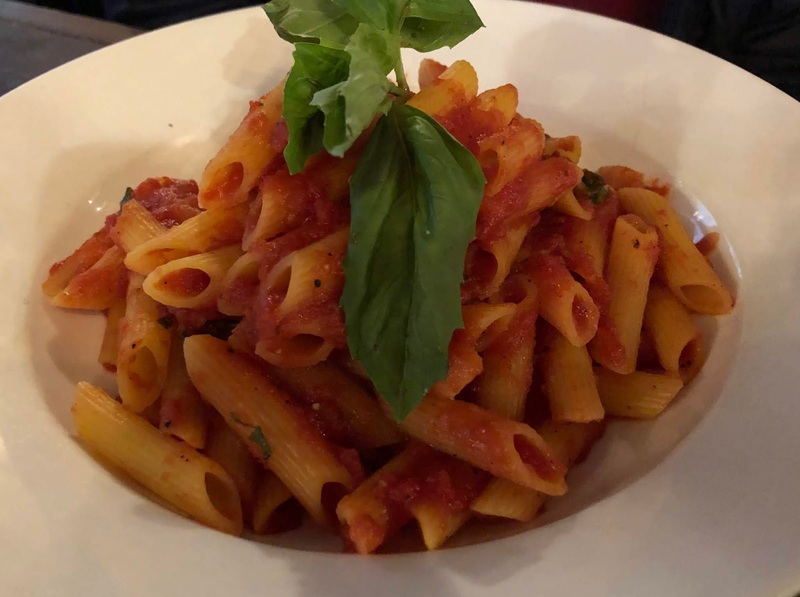 I was surprised when my daughter Katie ordered penne pasta with tomato sauce, fresh basil, Parmesan cheese, and extra virgin olive oil. She misread the menu and thought it would be served with mozzarella. It was good, but not what she had hoped for. 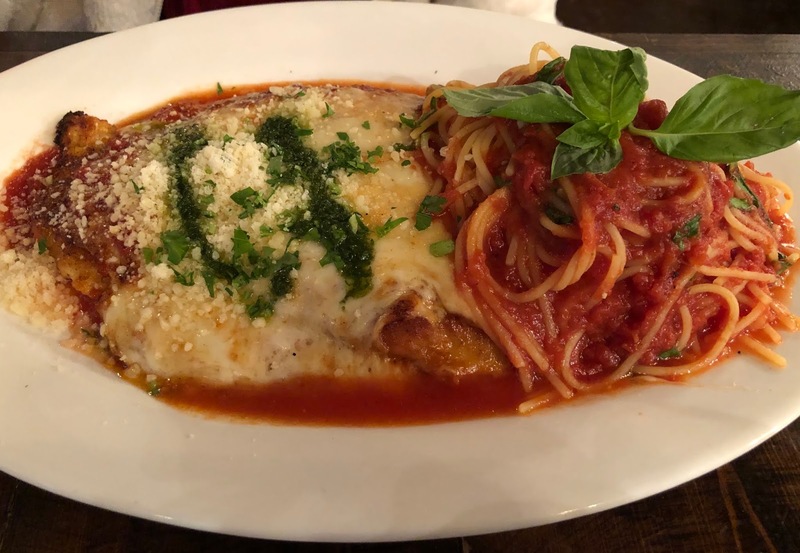 My daughter Emma, who loves chicken Parmesan, ordered the Pollo alla Parmigiana with spaghetti al pomodoro. The portion was huge, and my whole family enjoyed this dish. For dessert, we ordered homemade apricot and pistachio biscotti. They are usually served with chocolate sauce, but I asked if we could have a side of pistachio gelato instead. 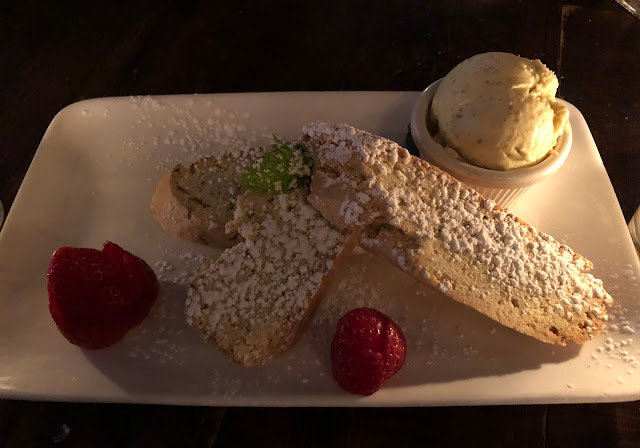 The biscotti were amazing, and so was the pistachio gelato. 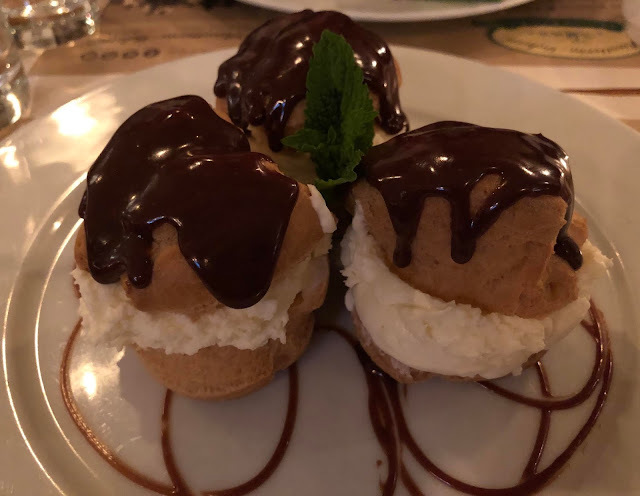 We also shared a cream puff with chocolate sauce on the side, which I ordered from the Holiday Specials menu. 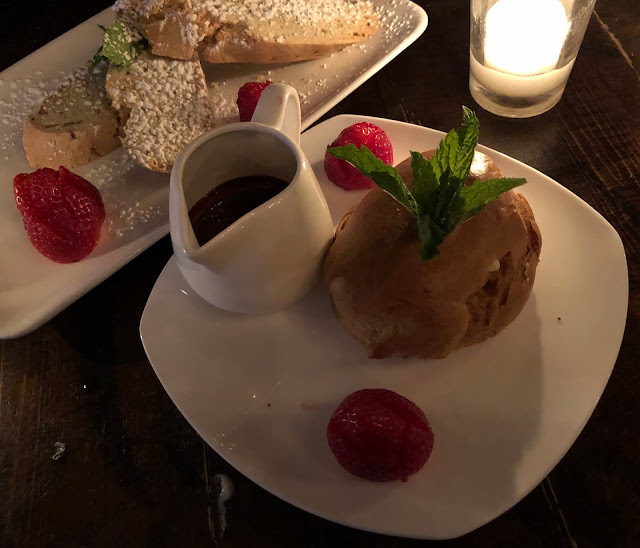 The menu said cream puffs, so I was surprised when we only received one for $14, but it was good, and we were pretty full from all the other food we had eaten, so everyone was content to have one bite. 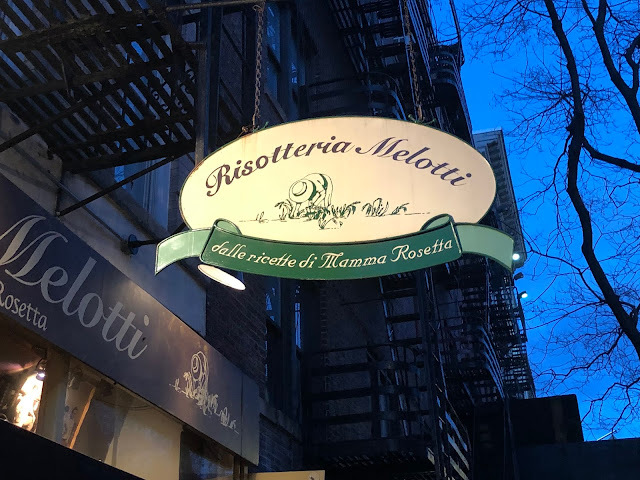 Our other favorite 100% gluten free sit-down restaurant in New York City is Risotteria Melotti. We dined at their restaurant in Rome in June during our trip to Italy. We had a great meal there, and our dinner in New York City did not disappoint. For appetizers, my family shared fried calamari and shrimp, and fried rice polenta with mixed wild mushrooms and Monte Veronese cheese. 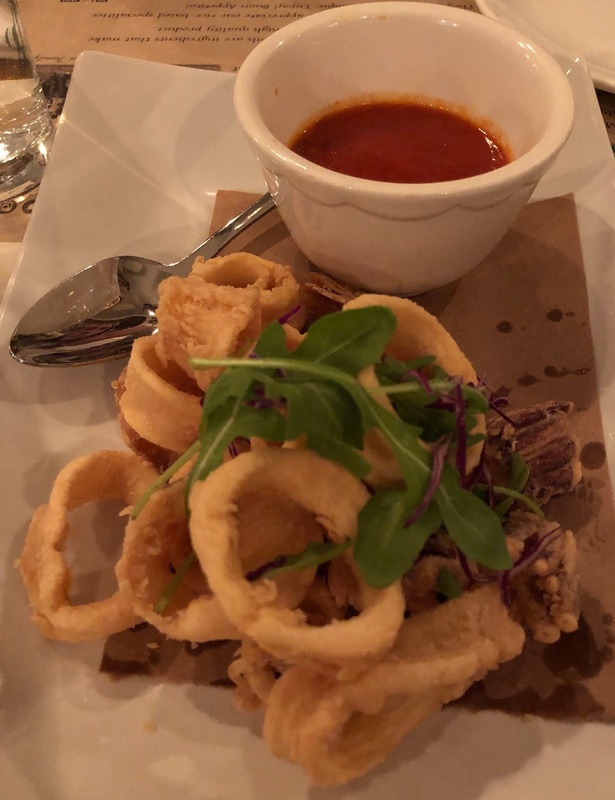 Thankfully, there were way more calamari then shrimp, which is what I prefer. 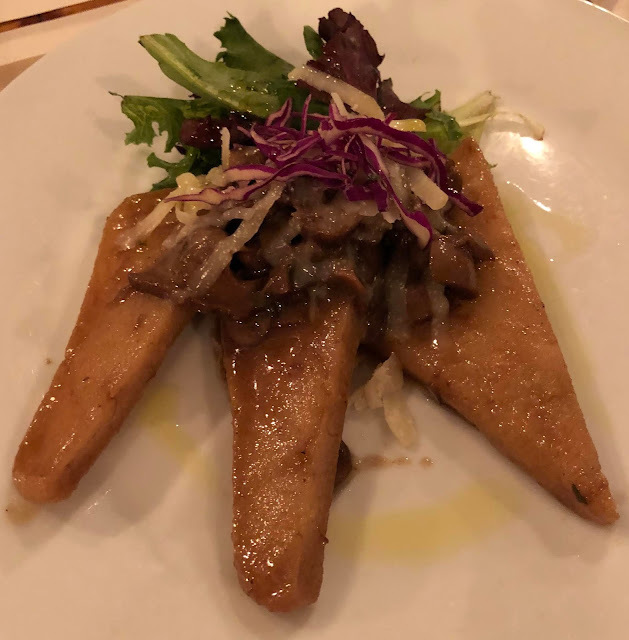 We had this appetizer on our last visit, and would definitely order it again the next time we visit Risotteria Melotti. The fried rice polenta with mixed mushrooms was so good, and very different than the appetizer with rice polenta and mushrooms we had in Rome. I loved the crispiness of the polenta, and the mushrooms and cheese were the perfect accompaniments. 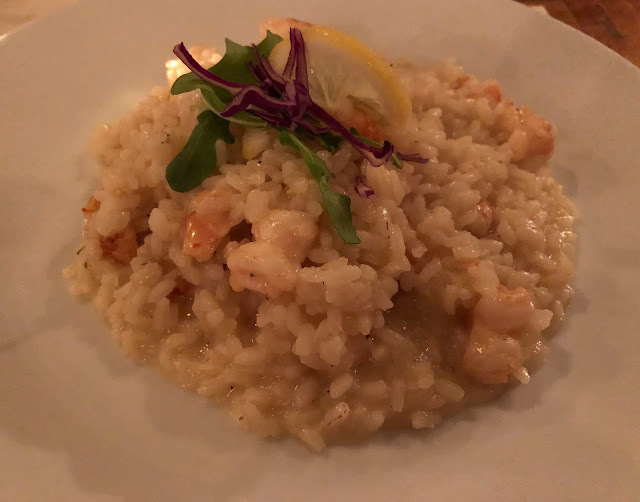 My daughter Katie and both ordered risotto with shrimp, fresh lemon juice, white wine, and Grana Padano PDO cheese. 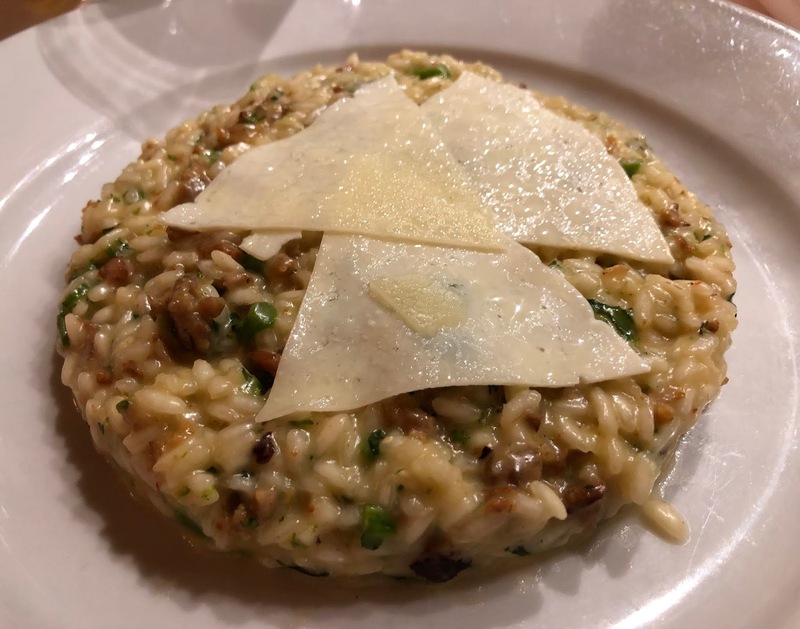 This was one of our favorite risotto dishes in Italy, and it was just as delicious in New York City. We both added a little grated cheese to our risotto, which our server offered to us at the table. My aunt was able to order a dairy free version of this dish, which she loved. 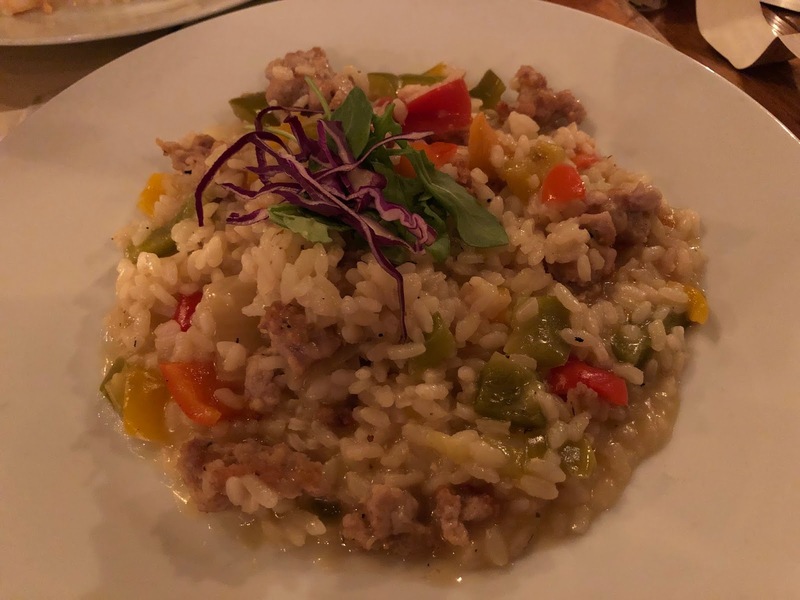 My daughter Emma ordered risotto with mixed bell peppers, homemade sausage, and Grana Padano PDO cheese. She enjoyed it, and my husband who shared it with her said it was his favorite risotto dish at the table. My uncle, who also eats dairy free, ordered the risotto with scallops, sundried tomatoes, and basil sauce. His risotto was a beautiful shade of green, and he said it was delicious. Sadly, I forgot to take a picture of it. 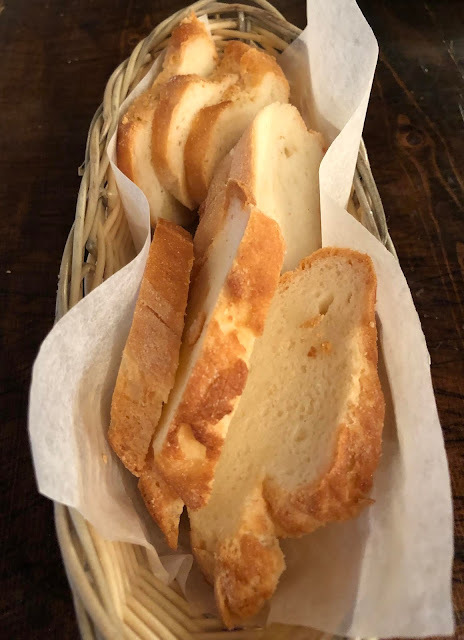 In Rome, and the last time we dined at Risoterria Melotti in New York City, we had amazing bread. 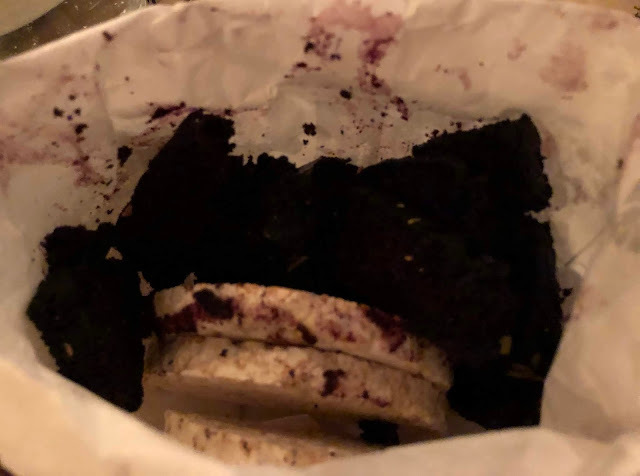 When we asked for bread, we were served rice cakes, which is normal for Risotteria Melotti, and a strange purple bread that was not half as good as what I am used to eating at their restaurants. One of the best things I ate in New York City were the profiteroles we had for dessert. They were filled with mascarpone whipped cream and drizzled with chocolate sauce. Words like heavenly and divine come to mind when I think of these profiteroles. My husband and I also shared an order of rice cookies and crispy rice sbrisolona served with Zabaglione. The rice cookies had a vanilla flavor and were pretty plain, but they were perfect for dipping in the Zabaglione. The crispy sbrisolona cookies had so much flavor, and were the star of this dessert. I am not sure what spices they used, but they had a fall flavor profile. My daughters and uncle ordered warm chocolate cake served with vanilla sauce, which can be made dairy free without the sauce. 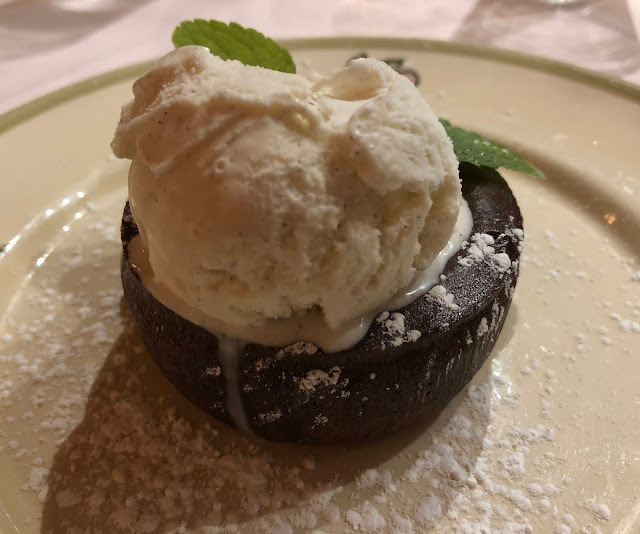 This dessert was rich and decadent, and everyone enjoyed it, but we always like a little vanilla ice cream with warm chocolate cake. My husband and I wanted to see The Book of Mormon, but knew it was not appropriate for our daughters, so we had a date night while my aunt and uncle entertained our twins. 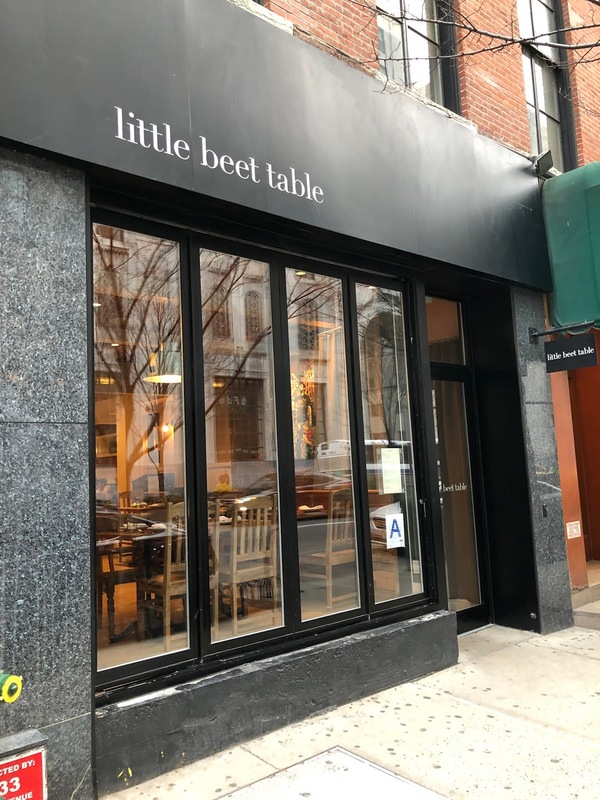 We had dinner at The Little Beet Table, another 100% gluten free sit-down restaurant in New York City. We love their fast causal sister restaurant, The Little Beet. They also have a sit-down restaurant in Chicago, which we dined at in 2017 for brunch. 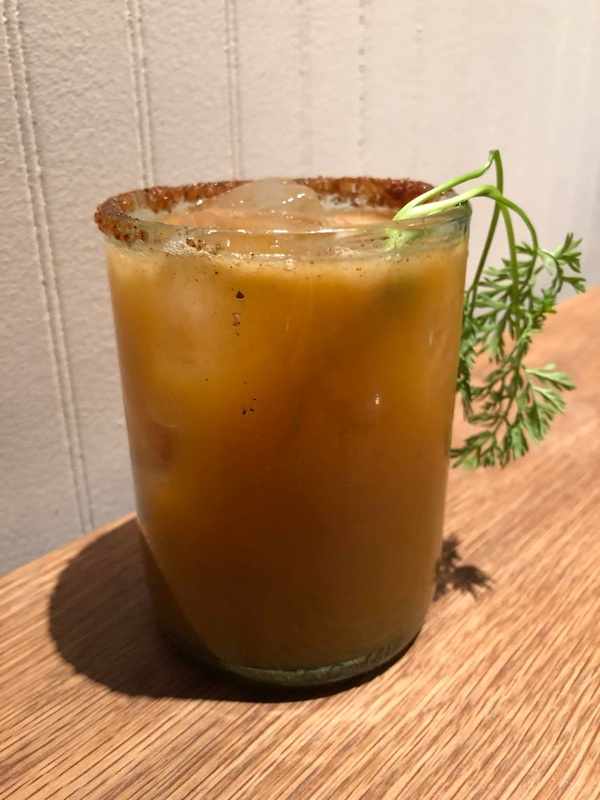 I decided to try one of The Little Beet Table's specialty cocktails, the spicy carrot margarita with Milagro tequila, cayenne, lime, and ancho chili salt. It was good, and not overly spicy. Because we had eaten a large lunch earlier in the day, my husband and I decided to split everything we ordered. 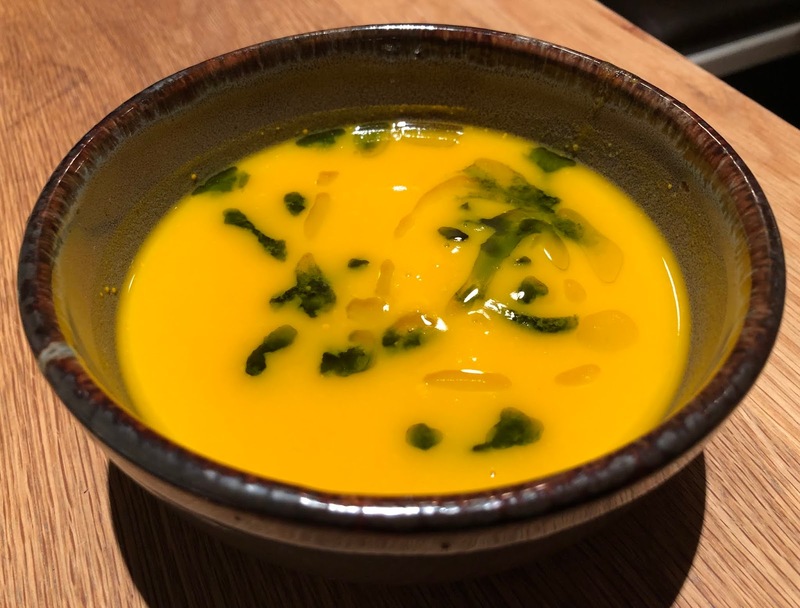 We started with a bowl of carrot ginger soup, the seasonal soup of the day. It was delicious, and the perfect way to start our meal on a cold winter day. 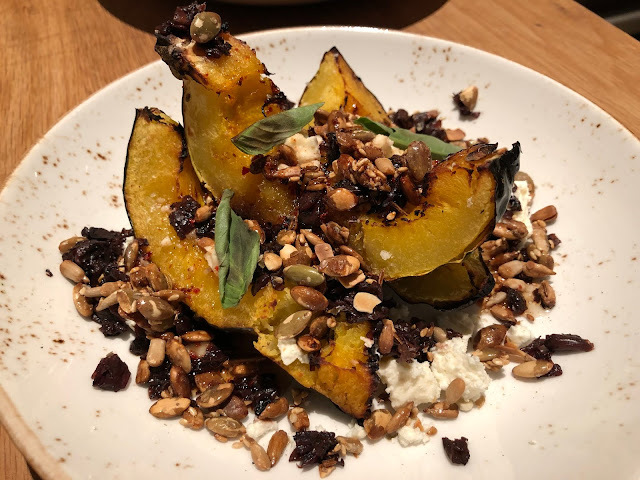 We loved The Little Beet Table's acorn squash with spicy honey, feta, grilled radicchio, and pumpkin seed granola. This dish had such an interesting mix of flavors and textures, and was probably our favorite of the evening. 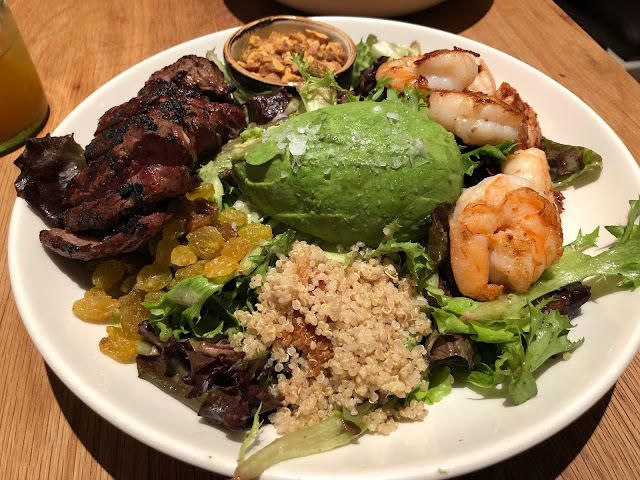 I almost never order salad as an entree, but we were not that hungry, and our server told us that the roasted shrimp salad with market greens, quinoa, avocado, spiced almonds, golden raisins, and a white balsamic vinaigrette is one of their most popular dishes. I was in the mood for steak, so we added strip steak for some extra protein. 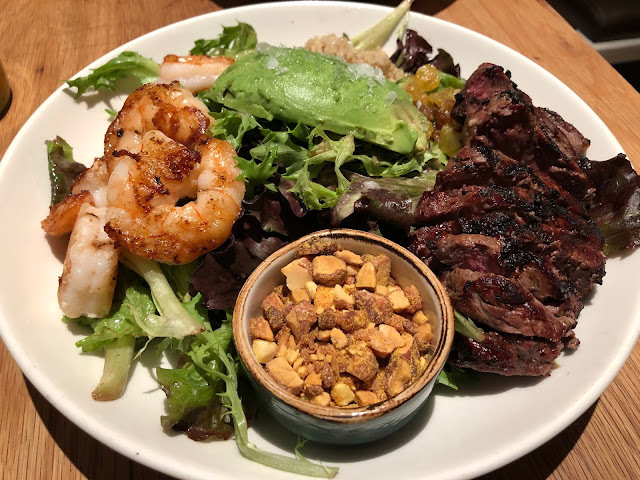 We enjoyed everything about this salad, but my favorite part was probably the spiced almonds, which we ordered on the side, because my husband does not like almonds. 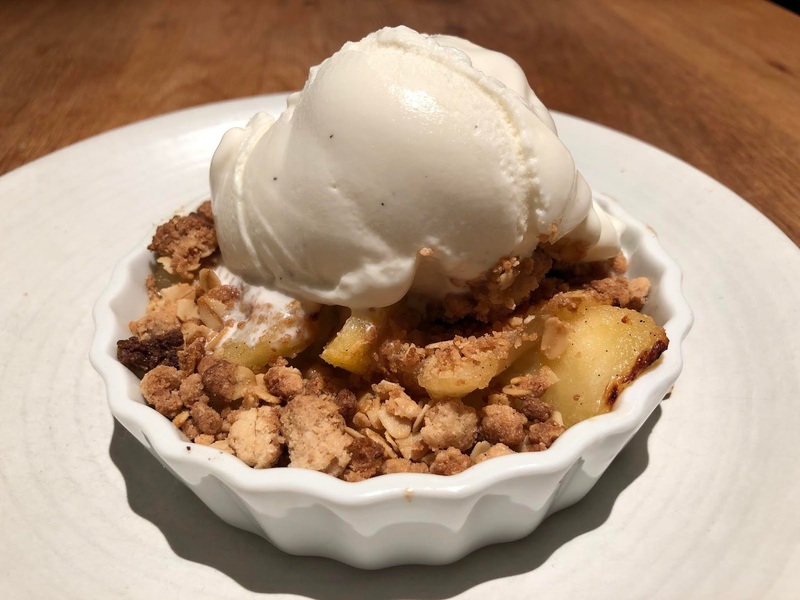 For dessert, we chose the apple crumble with oat streusel and vanilla ice cream. It was the perfect ending to a delicious meal. I asked my husband which 100% gluten free sit-down restaurant he liked the best in New York City. I presumed that he would pick one of the Italian restaurants we dined at, but he said he liked them all equally. On New Year's Eve, we had an early dinner at Bistango at the Kimberly Hotel, because we wanted to get back to the Marriott Marquis before things got too crazy in Times Square. It was also a short walk from Radio City Music Hall where we had seen the Rockettes Christmas Spectacular earlier that day. 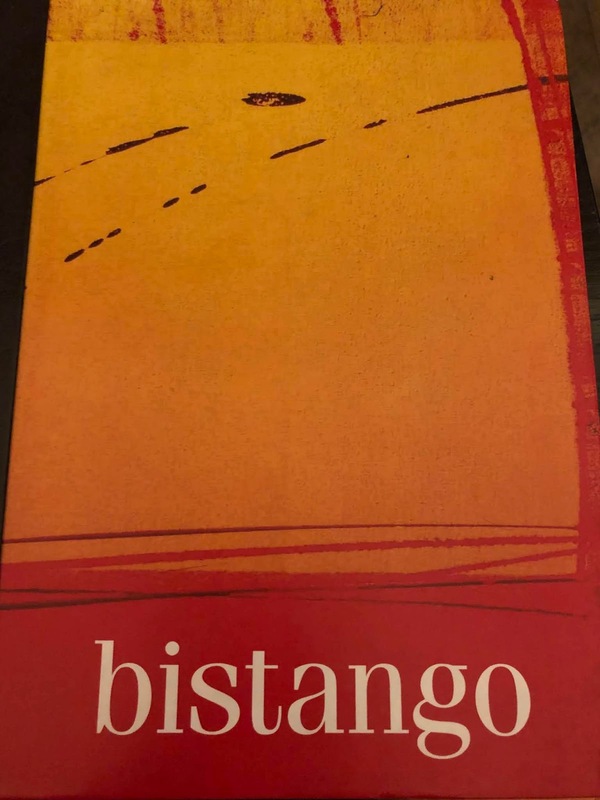 Bistango's original restaurant in Manhattan is on 29th street. Everything on their menus, which are a little bit different, can be made gluten free, including the desserts. Both Bistango locations take all the right precautions to keep your food safe from cross contamination, including separate pans, utensils, and cooking spaces. 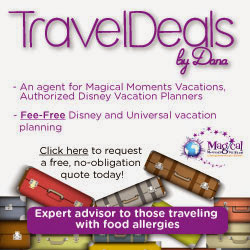 They do a great job accommodating dairy allergies too. My gluten free bread was different than my aunt's bread, which was dairy free and gluten free. 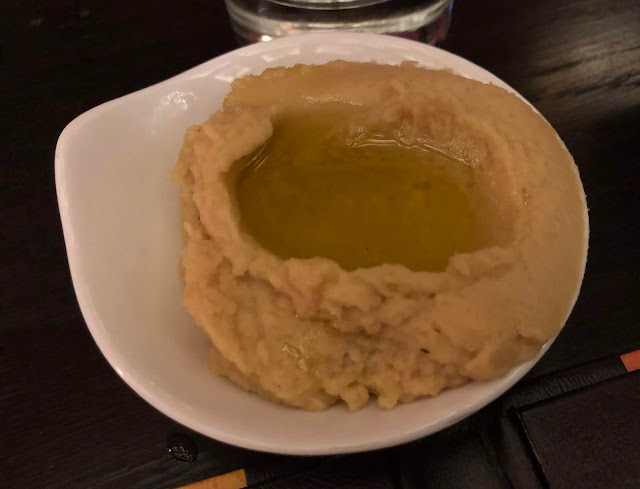 Bistango's delicious bread is served with hummus, which I find to be a little unusual in an Italian restaurant, but it is very good, and I ate way too much of it considering all the food I ordered. 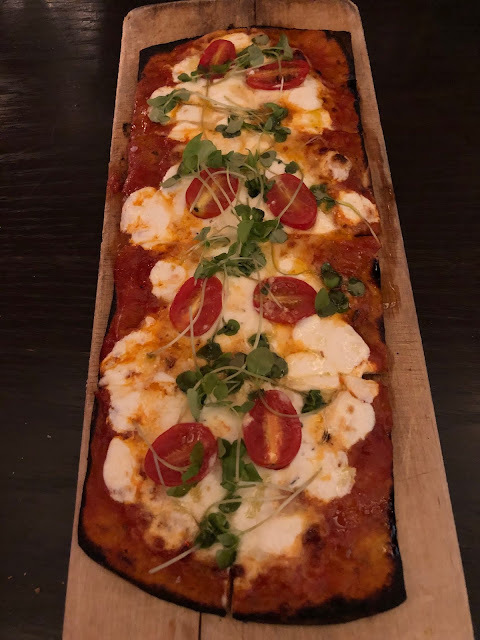 The last time we dined at Bistango, I ordered their flatbread margarita pizza with marinara, fresh mozzarella, ricotta, and basil. On this visit, it was just as good if not better than the last time we had it, because the crust was perfectly cooked. 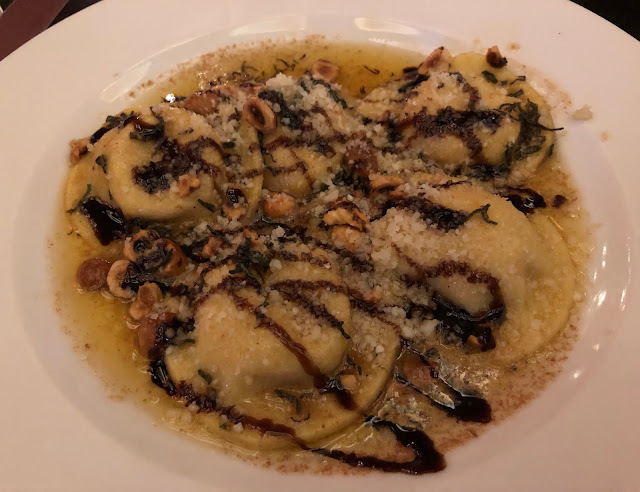 Bistango's gluten free butternut squash ravioli with brown butter, sage, and hazelnuts are incredible. This was definitely one of the best gluten free pasta dishes I have had at a restaurant since my celiac diagnosis. The filling was slightly sweet, and paired perfectly with the brown butter and sage sauce. I am pretty sure that Bistango is still buying their fresh pasta from DePuma's Gluten Free Pasta. 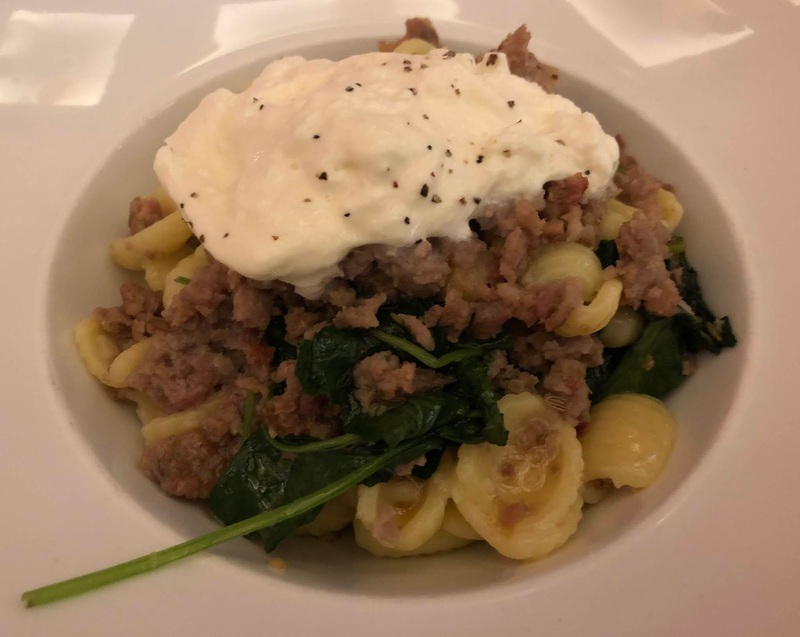 Another favorite from our last visit was the cavatelli with Italian sausage, kale, Calabrian chili, and stracciatella, so we had to order it again. This dish was just as amazing as the butternut squash ravioli, and I enjoyed being able to eat both of them, because the sweetness of the butternut squash ravioli was balanced out by the cavatelli, which had a bit of a spicy kick, which I loved. My aunt and uncle were able to order the cavatelli dairy free without the stracciatella, which is the incredible cheese on top of the dish. For dessert, I ordered apple tart, while both of my daughters ordered chocolate lava cake with raspberry gelato substituted for the salted caramel gelato that it is usually served with. 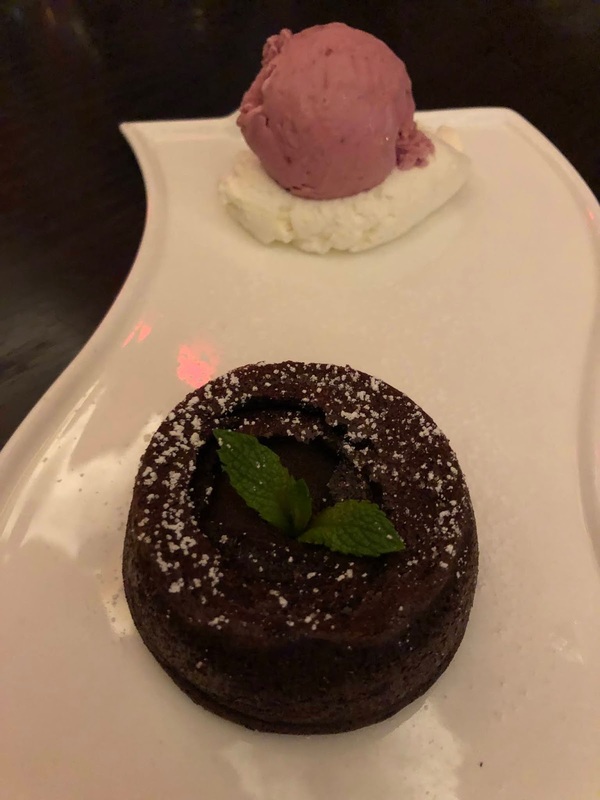 All of the desserts at Bistango are available gluten free, and my uncle was able to order the chocolate lava cake dairy free by substituting sorbet for the gelato. 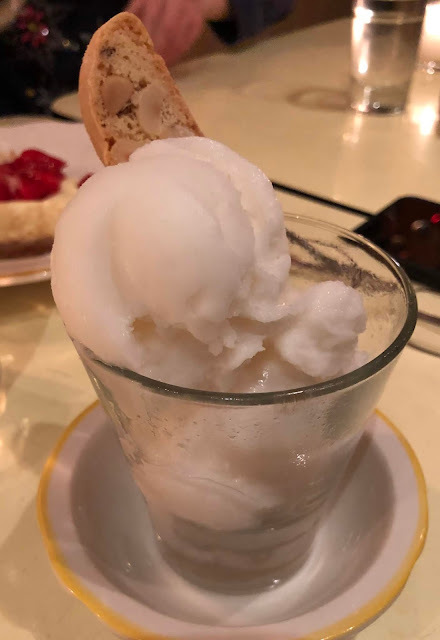 My aunt ordered a mix of lemon and peach gelato, which she enjoyed. 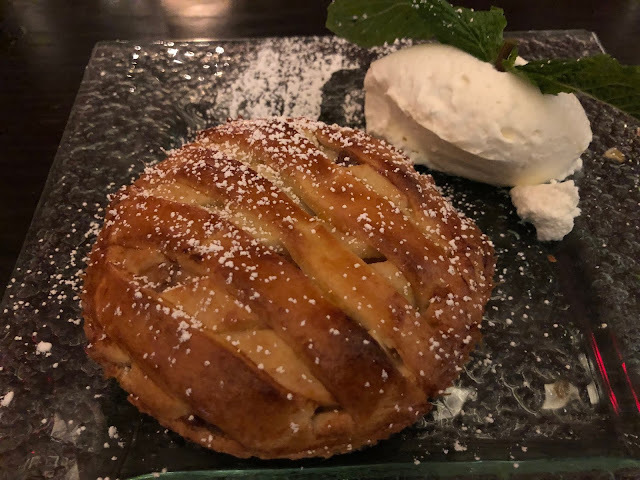 The crust on my apple tart was so good, I ate almost all of it, and had little to share with my husband, who usually eats all the dessert we have left. Another trusted restaurant in New York City for gluten free dining is Friedmans, which has several locations in New York City. We visited their Theater District restaurant inside the Edison Hotel several times, because it was convenient to the shows we were seeing, and the back entrance to the hotel was across the street from the Marriott Marquis. One of our servers told me that everything on the menu can be made gluten free except the matzo ball soup, and everything in the restaurant is gluten free except their gluten-filled bread. 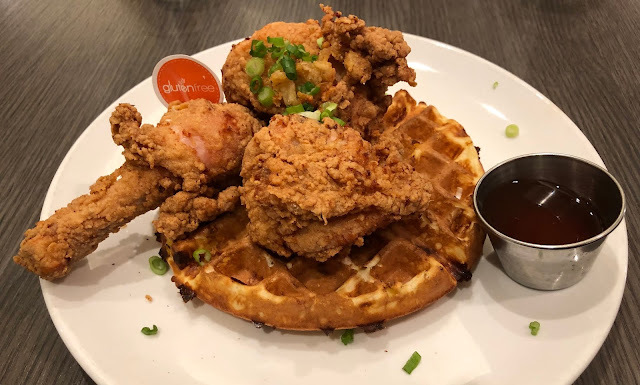 I did not have to order a gluten free version of their amazing fried chicken with a cheddar waffle and habanero honey, because it is naturally gluten free. Friedmans has an all day menu, so you can order this dish for breakfast, lunch, and dinner. Their fried chicken was so crispy and delicious, and I was really impressed with the waffle as well. I thought I would prefer my chicken and waffle with traditional maple syrup, but the habanero honey was the perfect finishing touch to this dish. On Christmas Day, we had a late breakfast at Friedmans, which was quite crowded. They do not accept reservations, but thankfully, we were seated in about 15 minutes. 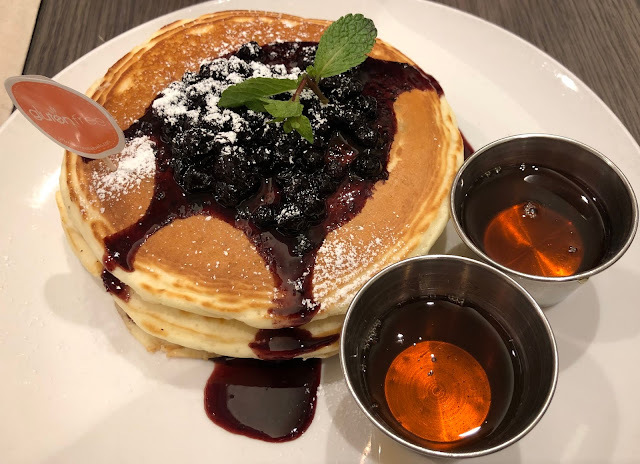 My husband ordered blueberry pancakes with Vermont maple syrup, while my daughters and I chose french toast with berry compote. My daughters loved their gluten-filled french toast, but my husband and I thought the pancakes were dry, and I did not like the berry compote on my french toast. 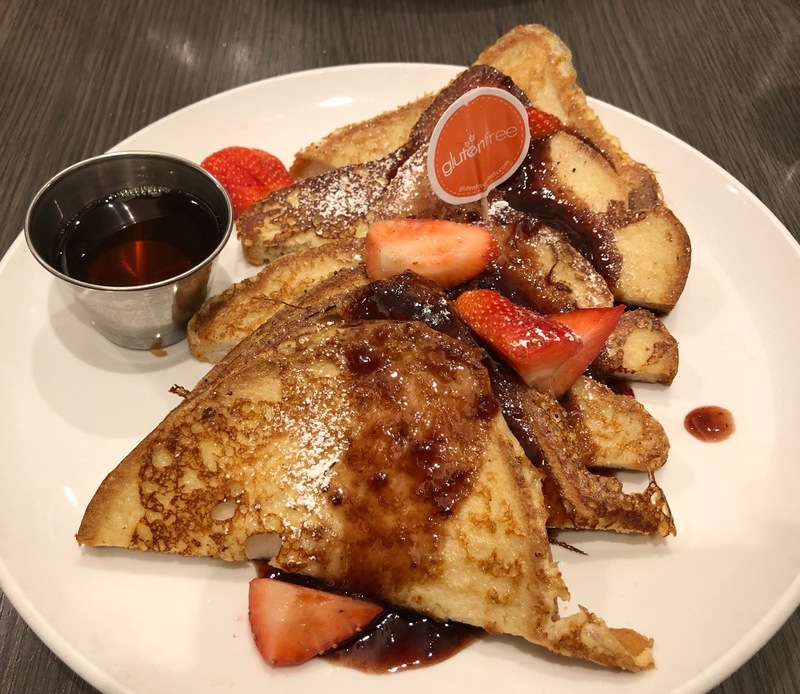 If I ever order french toast at Friedman's again, I would ask for the blueberry topping on the pancakes, which was really good. Later in the trip, I had breakfast at Friedmans with my aunt, and ordered the fried chicken with a cheddar waffle. It was good, but I definitely prefer this dish for lunch or dinner. 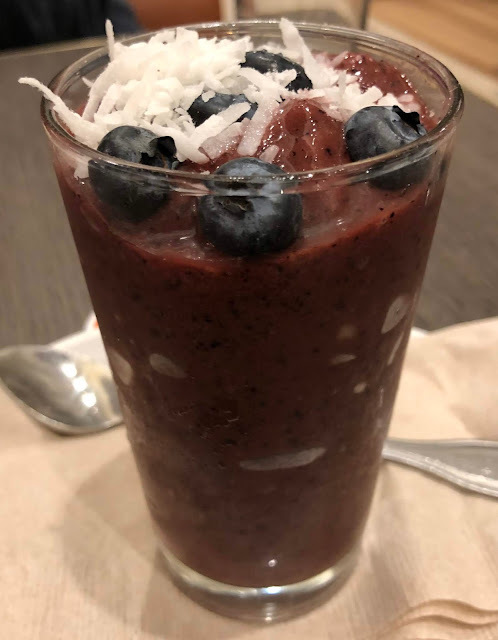 On three separate occasions, I had an acai smoothie from Friedmans. The first time was on Christmas Day, and I was definitely surprised when it arrived at the table with coconut all over the top. When I ordered it at the bar to go, I made sure to ask for no coconut. 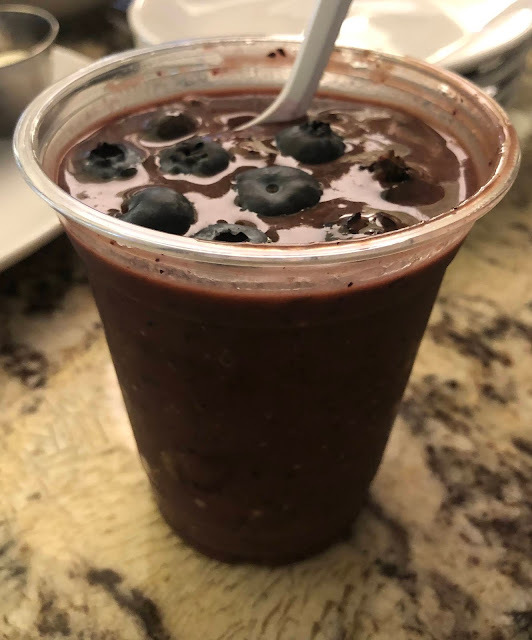 I love that it included blueberries, so I could get my fix of fruit for the morning, but I wish it was just a little less sweet. 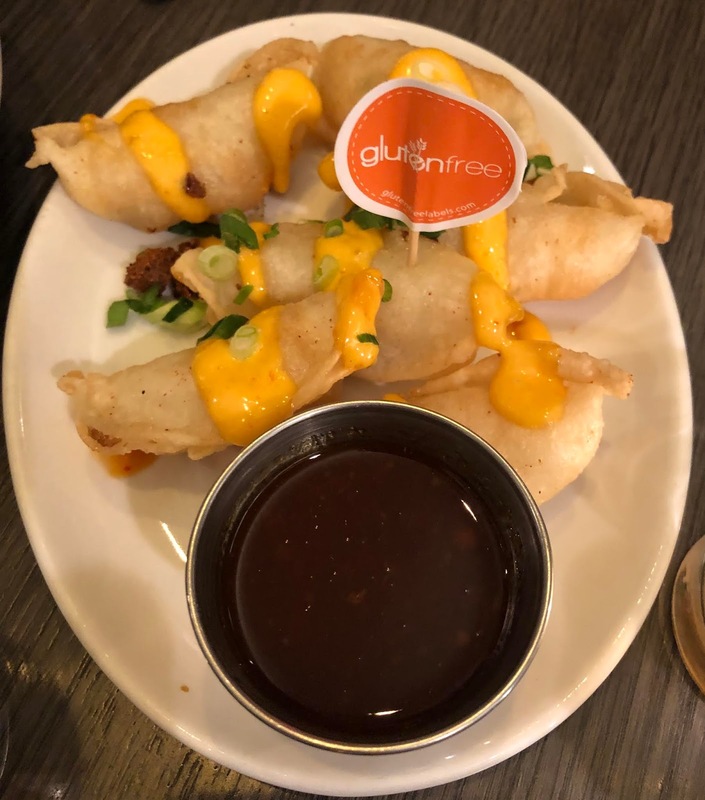 When we stopped in for dinner, we ordered vegetable potstickers with sriracha aioli and ginger soy dipping sauce. I forgot to ask for the aioli on the side, so I left them for my husband to eat, because I do not eat anything with aioli or mayonnaise at restaurants. 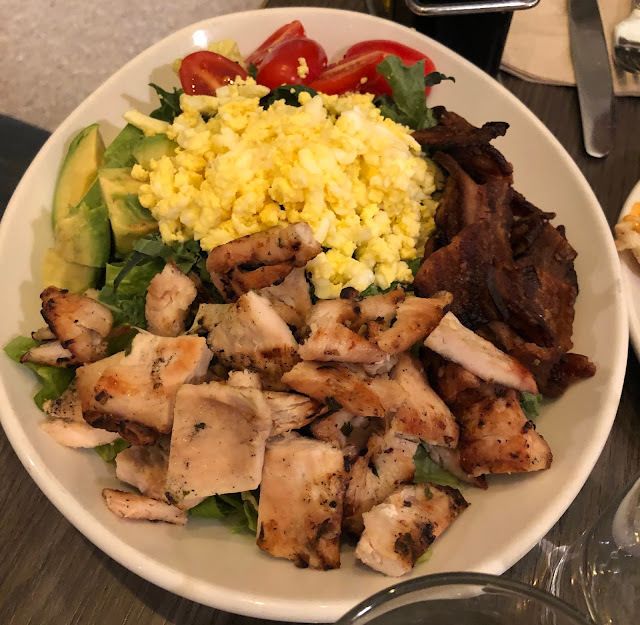 My friend Ron enjoyed his cobb salad minus the blue cheese, and oil and vinegar subbed for the buttermilk ranch dressing. On New Year's Day, we had dinner at STK Midtown. 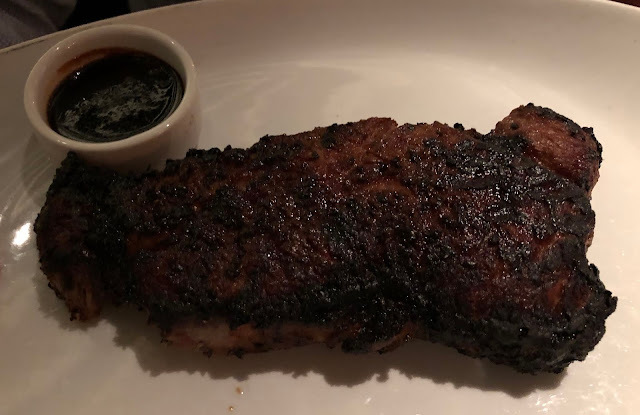 STK Orlando is one of our favorite restaurants at Disney World, so we were excited to dine there our last night in New York City. My daughters and I shared a 10 ounce filet with red wine sauce. 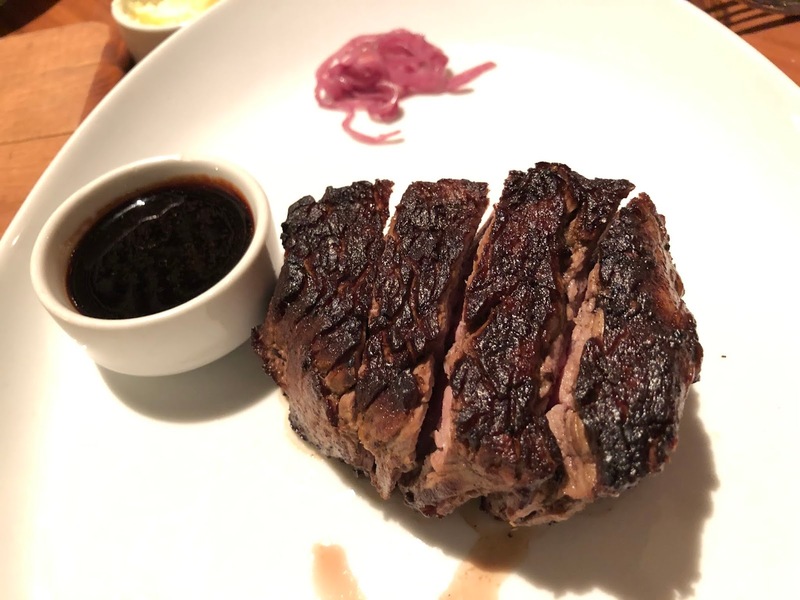 It was so incredible, I could have eaten the whole steak by myself. My daughter Emma is not a big red meat eater, but she loves the filet at STK. 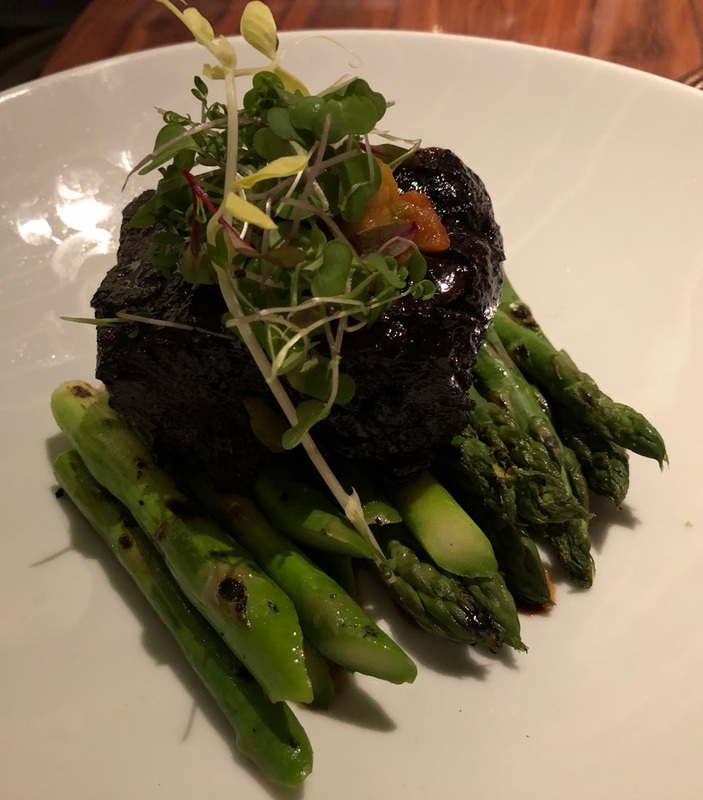 We have tried other sauces at STK, but the slightly sweet red wine sauce is our favorite. 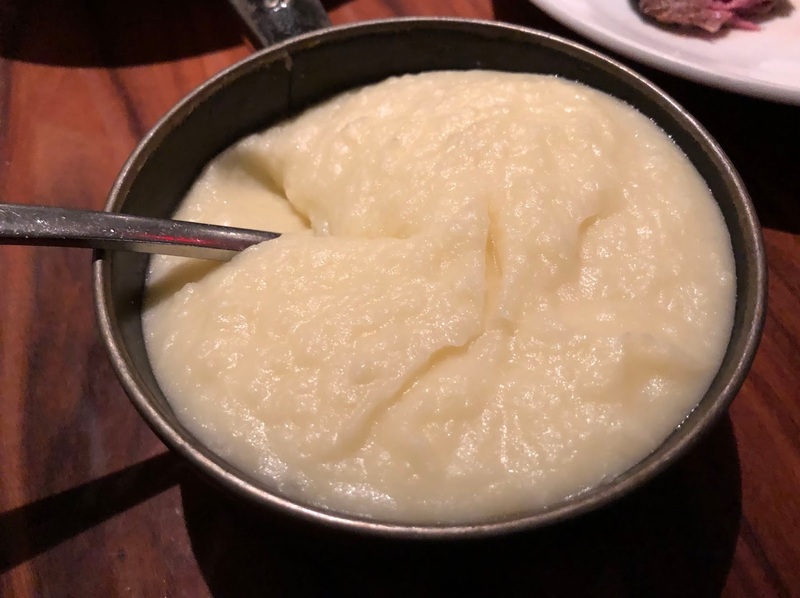 The grits at Disney World are always perfect, but they were a little too cheesy for me in New York City. 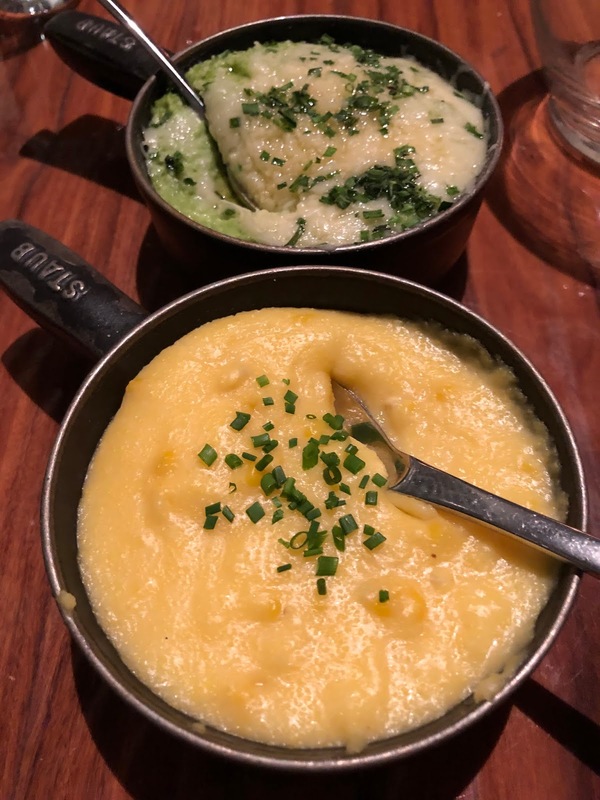 Unlike our servers in Orlando, our server at STK Midtown was not that knowledgeable about what dishes were gluten free, and he actually told me that the sweet corn pudding had gluten in it. Thankfully, he checked with the chefs about everything I wanted to order, and I was excited that the sweet corn pudding was safe for me to eat. My husband enjoyed his New York strip steak with red wine sauce, and my gluten and dairy free friend Ron loved his braised short rib with asparagus subbed for the jalapeno cheddar grits. 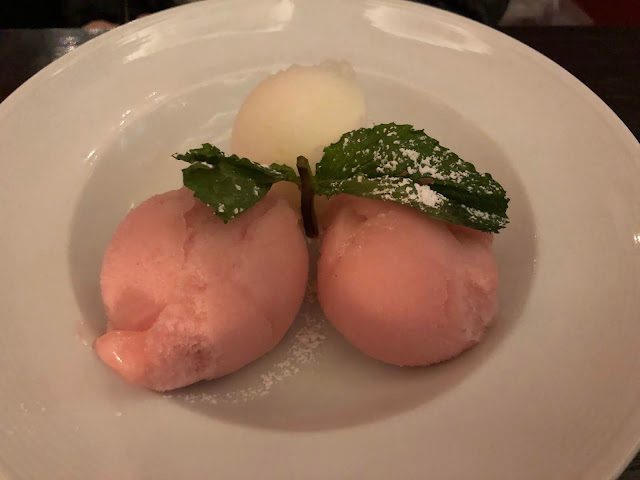 The only gluten free dessert at STK Midtown was sorbet, so I was thankful I had bought some pastries at Noglu earlier in the day. My aunt and uncle like to dine at Nizza, because it is close to the Theater District, and they enjoy the food. Nizza, which serves French accented Italian cuisine, has a large gluten free menu. 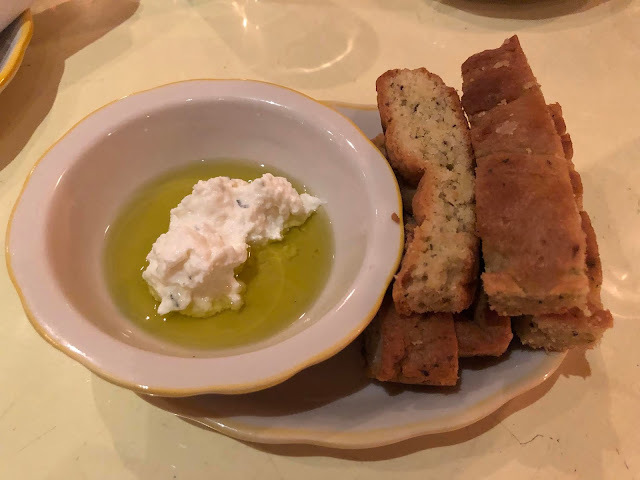 My meal started with their delicious gluten free focaccia with olive oil and a soft Italian cheese. 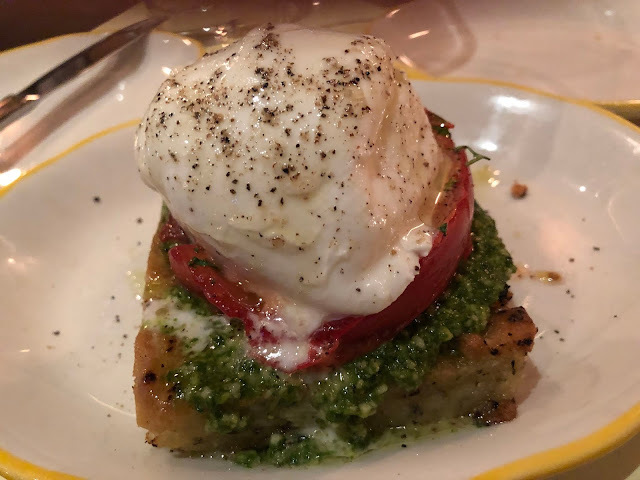 I considered ordering their pasta pesto, which I ate the last time we dined at Nizza, but after viewing some pictures on Instagram, I decided to chose the burrata antipasti with roasted tomato, arugula pesto, and grilled gluten free focaccia. I subbed buffalo mozzarella for the burrata, because burrata can be a little too runny for my taste. I only ordered an appetizer, because I was still full from lunch, and we had a super early reservation for dinner. I enjoyed it enough to order on future visits, but might get their amazing pasta pesto the next time we stop in. 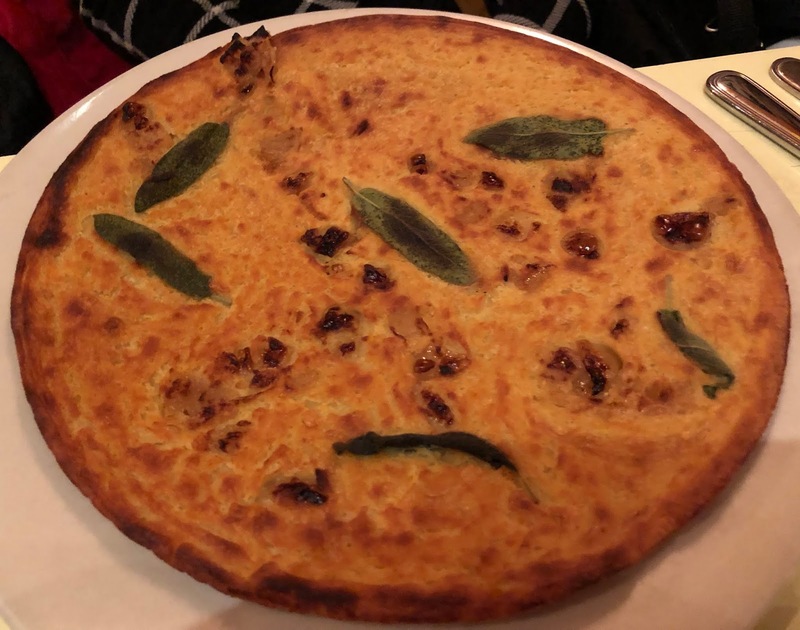 My aunt always gets a gluten and dairy free original socca without cheese when she dines at Nizza. It is a thin chickpea pancake cooked in its own pan in their brick oven. I tasted it on this visit, and thought it was good, though I would prefer it with cheese. Nizza has ten different socca options to choose from. 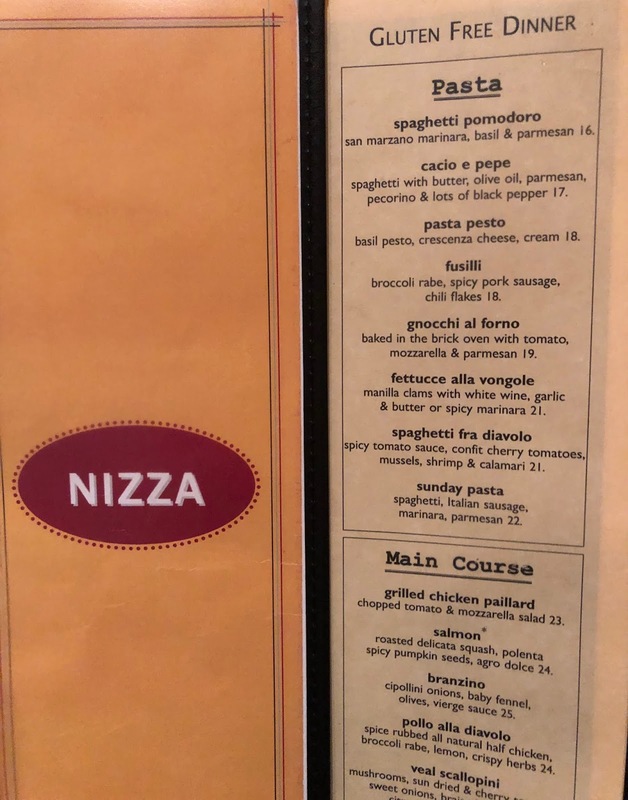 Our server told us that all of Nizza's dessert options can be made gluten free except the tiramisu and the apple crostata. 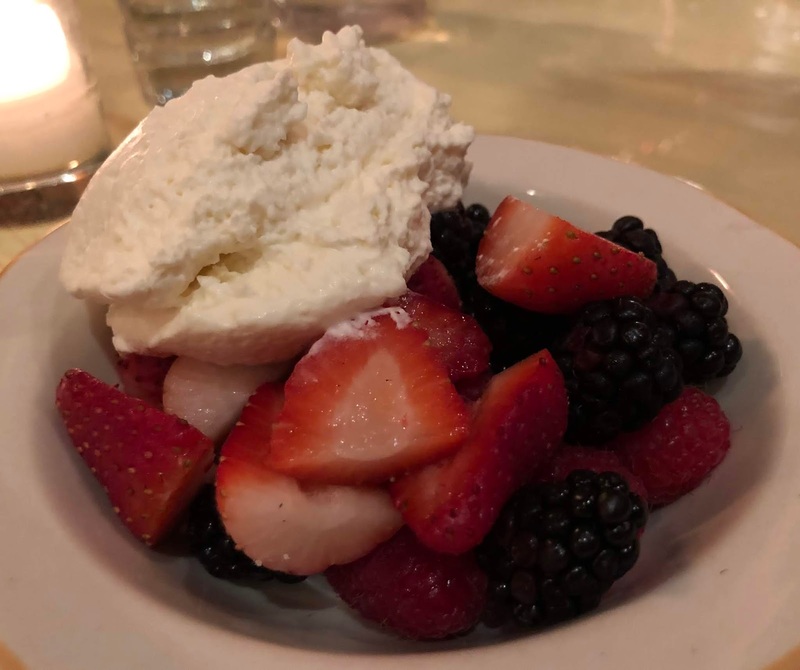 I was in the mood for fruit, so I ordered the fresh berries with marsala cream. I also tried my family's ricotta cheesecake with lemon custard, berry compote, and a biscotti crust. We all loved this dessert. 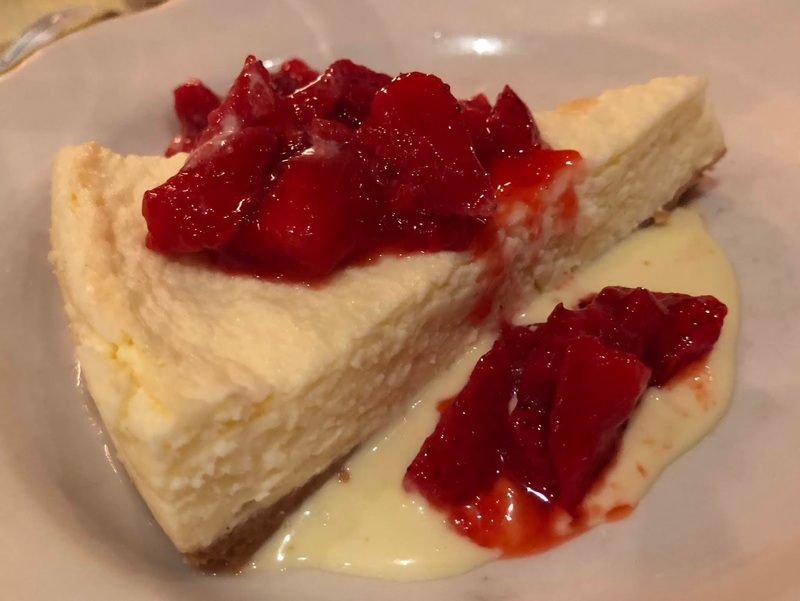 After visiting Italy last summer, I have to say that cheesecake is much better with ricotta than cream cheese. 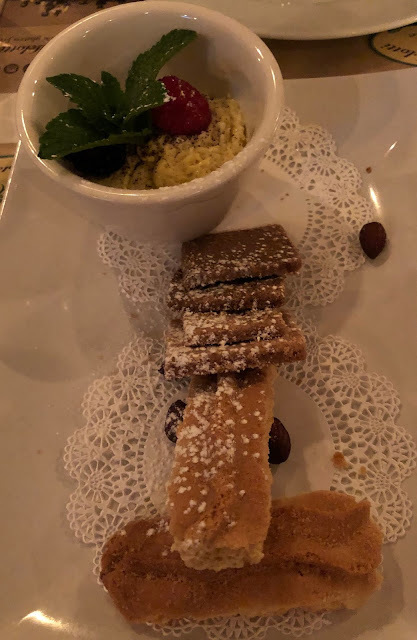 My uncle enjoyed his Meyer lemon sorbet with a biscotti. Our server told me that they have gluten free and gluten-filled biscotti for this dessert. 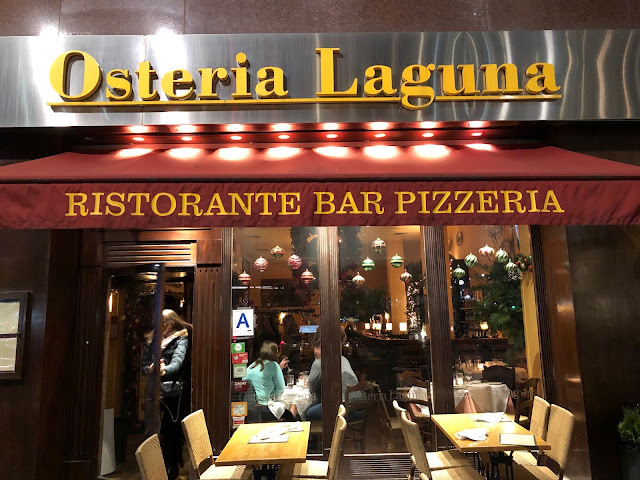 Our first night in New York City, we had Christmas Eve dinner at Osteria Laguna. The only reason we chose this restaurant is because our flight arrived late that night, and we wanted to dine as close to our hotel as possible. I found Osteria Laguna using the Find Me Gluten Free app. It had good reviews, and was right across the street from the Westin New York Grand Central, where we stayed the first four nights of our trip. Our first sever was so incredibly rude when I asked about gluten free options. He told me I could have pizza or pasta, which I had no interest in. When I asked about the risotto dishes, he told me he had no idea about my dietary restrictions, so I asked if there was someone else I could speak to. Thankfully, he never came back, and a new server came to our table to take our order. Our second server seemed friendly enough, and was willing to check on other gluten free options for me. It turns out the risotto dishes were gluten free, so I ordered the porcini mushroom risotto with black truffles, baby arugula and Parmigiano. My risotto was good, but I quickly realized that I had been given another risotto dish on the menu with sweet and spicy sausage, broccoli rabe, and Pecorino cheese. Sever number two insisted that that was the dish I ordered, and did not offer to replace my meal. I was not happy with the mistake, but it was late, and my entree was good, so I decided to let it go. For dessert, I ordered the chocolate lava cake, which I really enjoyed. 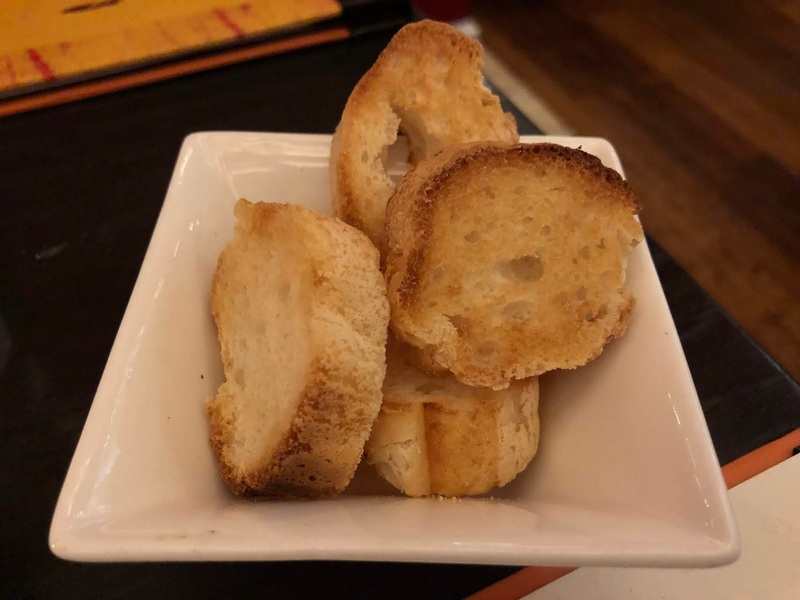 The food was good, but the service was slow, the chairs were uncomfortable, and it was our worst service experience in New York City, so we would never go back. Thankfully, I did not feel like I was glutened at any restaurant we dined at in New York City. My next post about our Christmas Break trip will feature the bakeries, ice cream and coffee shops, and fast casual restaurants we dined at. I do a lot of research before we travel. On this trip, my best resource was a Gluten-Free Globetrotter post called Dedicated Gluten-Free in New York City. I also follow a lot of gluten free New York City and travel bloggers on Instagram, and I used the Find Me Gluten Free app. My friend Amanda has some great New York City reviews on her blog The Gluten & Dairy-Free Review Blog. What are your favorite sit-down restaurants in New York City for gluten free dining?